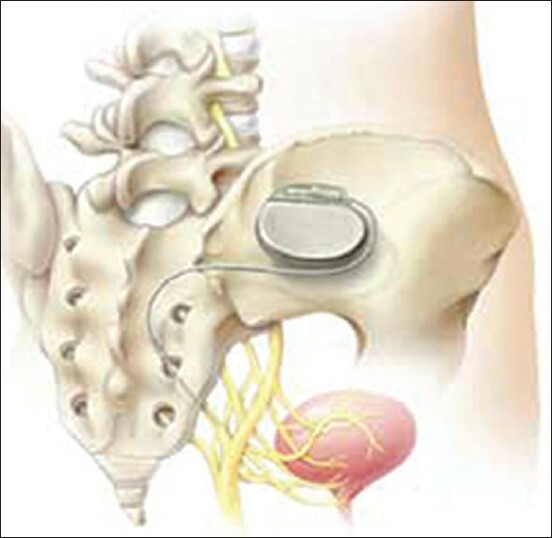 Sacral neuromodulation is well established in the treatment of refractory, non-neurogenic lower urinary tract dysfunction, but its efficacy and safety in patients with lower urinary tract dysfunction of neurological origin is unclear. Only few case series have been reported for multiple sclerosis. We prospectively evaluated the efficacy and safety of sacral neuromodulation in patients with multiple sclerosis. Seventeen patients (13 women, 4 men) treated with sacral neuromodulation for refractory neurogenic lower urinary tract dysfunction caused by multiple sclerosis were prospectively enrolled (2007–2011). Patients had to have stable disease and confirmed neurogenic lower urinary tract dysfunction. Voiding variables, adverse events, and subjective satisfaction were assessed. Sixteen (94 %) patients had a positive test phase with a >70 % improvement. After implantation of the pulse generator (InterStim II), the improvement in voiding variables persisted. At 3 years, the median voided volume had improved significantly from 125 (range 0 to 350) to 265 ml (range 200 to 350) (p < 0.001), the post void residual from 170 (range 0 to 730) to 25 ml (range 0 to 300) (p = 0.01), micturition frequency from 12 (range 6 to 20) to 7 (range 4 to 12) (p = 0.003), and number of incontinence episodes from 3 (range 0 to 10) to 0 (range 0 to 1) (p = 0.006). The median subjective degree of satisfaction was 80 %. Only two patients developed lack of benefit. No major complications occurred. Chronic sacral neuromodulation promises to be an effective and safe treatment of refractory neurogenic lower urinary tract dysfunction in selected patients with multiple sclerosis.